I’m participating in New West Writers Photo Prompt! You can check out their page and the post I’m responding to right here. I hope you enjoy this fictional very short story, and let me know what you think! What do I think of when I think of my sister? Is it the way her hair glistened in the sun, the beautiful smile that was always on her face, or the smell of her perfume that gently stayed behind long after she’d left a room? No, it is none of these things, although they all rush to my mind when her name comes up or my mind wanders to her. Music is the thing I think of first when I think of my sister. It’s been four years since she died, four long years of loving and hating music. The violin was her favorite, her ‘baby’ if you will. She played it beautifully, you could lose yourself for hours listening and watching her play that violin. My mother offered it to me, but I couldn’t take it. It was too painful a memory to have so physically close when I swear I still hear her laughing in the other room already. I’ve been going to therapy, and slowly I’m learning better ways to cope and deal with the pain of losing someone so wonderful. Someone with the whole world ahead of her, except not the world I wanted her to have. It may come as a surprise, but through this therapy, I’ve come to the realization I need to get a seahorse. I have pictures of her, and a box of clothes and other small possessions in a box in my closet. I know it’s been four years, but it’s still too soon for her things to be out in the open for me. Like I said, music-that violin-is the memory of her I hold closest. I used to stare at that f hole when she would play. I would become mesmerized staring at it, sitting there with her in a moment that would make time stand still. Just the two of us, and the beautiful notes singing out of that violin, with that beautiful f hole on its side. Although not quite the same, every time I see a seahorse, I think of the f hole on her violin, I think of my sister, and I smile at this beautiful marine animal. I may not be ready to move her things out in the open, but I would like to take care of this tiny creature, and in turn have him looking out for me, and reminding me that music is beautiful, music is love, and is everything my sister was, and everything she would want me to hold onto and believe in. 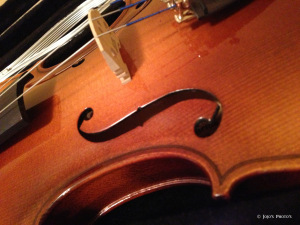 This entry was posted in Uncategorized and tagged blogging101, nww photo prompt, violin. Bookmark the permalink. The seahorse image on the violin is a wonderful connect to sweet memories and present hopes of caring. Very nice, Lydia!